» The heat is on! Good afternoon everyone… After the death of Murtu, one of the last big pride males, there is only one big male left in the south. His name is Mufasa and is in the Rooiputs area. Three pride-males died the last 12 months in the south, so there is competition among the younger males, and things are heating up in the Samevloeiing area. Here is two males getting irritated with each other. 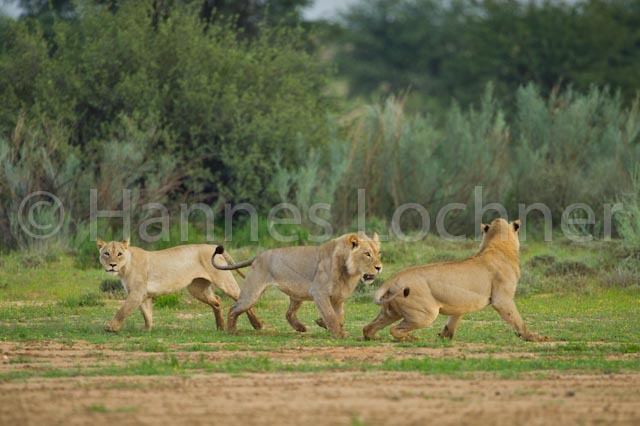 There is about four young males in this area and they already started to mate with the pride females. There are three females all-together. This could make for some top action pictures! I will be in the KTP in 2 weeks time and hope to catch some of it. I will be at Nossob for 2 nights and then at Mata Mata for 2 nights. The park is looking very green. Is the Nossob road open north of the samevloeiing? Hier is moeilikheid oppad! Mooi aksie-foto. You have to keep track of what happens and let us know. This entry was posted on 14/04/2011 at 11:53 and filed under blog.lochnerphoto.com. You can follow any responses to this entry through the RSS feed. You can leave a response, or trackback from your own site.